Chairman of Kaya Farms, Balram Vaswani, has said that sister company, Kaya Herbhouse is set to officially open its doors in March to the Jamaican public and visitors to the island, who are interested in sampling its offerings of medical marijuana and related products. In making the announcement on Tuesday, Vaswani said persons wishing to purchase ganja and ganja products must comply with one of four regulations. “We remain in compliance with the rules enacted by the Cannabis Licensing Authority (CLA), and persons will be able to legally purchase marijuana for medicinal purposes while also being able to experience the Kaya Herbhouse and Kaya Café,” Vaswani said in a press release. The development comes as Vaswani’s Kaya Farms – which is home to the country’s first legal medical cannabis dispensary – harvested its first crop. The first official ‘cut’ and harvest took place on Tuesday in the presence of Augustus Staples, Chief Executive Officer of the CLA, at Kaya Farms in Drax Hall, St Ann. According to a press release, the plants from the harvest will be cured, trimmed and packaged for sale to Kaya Herbhouse in St Ann for the first sale to medical patients, and ‘Everything Oily’ for processing. This it said satisfies the tripartite agreements signed to ensure a closed loop system for the sale of marijuana as enacted in the Dangerous Drugs (Cannabis Licensing) Regulations. The press release said the regulations allow for the sale and use of ganja for specific reasons, namely in accordance with the written recommendation or prescription of a registered medical practitioner, for consumption on the premises or for the provision of therapeutic services utilising ganja. “I am truly honoured as a Jamaican to make the historic step where our country can finally monetise on this industry as Europe, Australia, India, China, and the US have already done,” said Vaswani. According to the release, Kaya’s goal is to make Jamaica the flagship of the global wellness tourism industry and become the new symbol of the island’s roots and lifestyle. In the 40th year since the release of Bob Marley’s romantic album Kaya, the legend’s slang for cannabis has become a branding tool in the ongoing campaign to legalise the herb. Many of the sons of the global reggae icon have put action to Tuff Gong’s long-standing cannabis advocacy. Rohan Marley of Marley Coffee (left) and Balram Vaswani, chairman of Kaya Inc, cutting the ribbon to the Kaya Café at the grand opening, recently. Stephen, Ziggy, Ky-mani, Julian, and Damian Marley will headline the second annual, all-ages Kaya Fest, named after the 1978 album. The music festival relocated from Miami, Florida, to San Bernardino, California, where the festival can benefit from the state’s legalisation of cannabis for recreational use. The two-day concert will also feature guests Toots and the Maytals, Lauryn Hill, Cypress Hill, and Tom Morello. “He would be at the forefront of this movement for people to know the herb. It’s in his nature, where he come from,” Stephen said in an interview with Rollingstone Magazine. In 2016, the family launched Marley Natural, a name brand for various strains of cannabis, pipes, hempseed body wash, and other products. “You see marijuana becoming legal. You see his legacy has taken on more importance because of what he has been telling people for years. ‘Hey, I told you so!’ So the legacy has grown another step,” Damian added. Also making bold moves is the entrepreneurial son, Rohan Marley. As of last weekend, Ocho Rios, St Ann, became home to Kaya Farms, the first legal medical cannabis dispensary in the English-speaking Caribbean. Kaya Farms and sister companies Kaya Herbhouse, Kaya Spa, Kaya CafÈ, and Kaya Tours plan to offer a variety of services for Jamaicans and tourists, including the sale of marijuana for medicinal and therapeutic purposes. Participating in the grand opening event last weekend was Balram Vaswani, chairman and chief ganja officer at Kaya Farms and his associate Rohan, chairman of Marley Coffee. 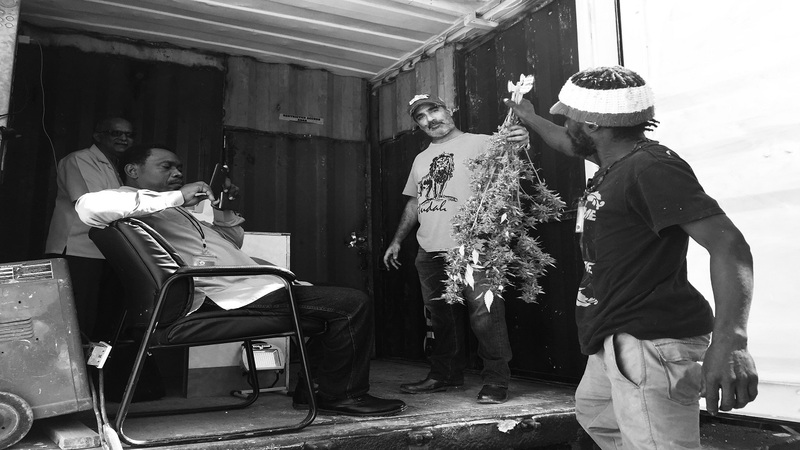 “It’s great when what is naturally produced here, the herb, can become a business and drive the economy. So it’s never too late, and that’s why it’s happening right now,” Rohan said during the launch. He accompanied Vaswari in the official ribbon-cutting ritual. “For me, the journey has been extremely long. This is an economic change for Jamaica. With this product, we have a chance for it to be a product of Jamaica, made in Jamaica, where we can control the start to finish. This could be an export. This can bring in revenue and wealth creation and help small farmers all the way up to large companies – not only farmers but auxiliary businesses, carpenters, plumbers, bartenders, etc,” Vaswani said. Guests are welcome to tour Kaya Farms and its processing facility and kick back inside Kaya CafÈ, which exclusively carries Marley Coffee. Guests to Kaya Farms are able to purchase various strains available and legally purchase medicinal marijuana, once proper documentation as required by the Cannabis Licensing Authority (CLA) has been provided. The regulations outlined by the CLA allow for the sale and use of marijuana in limited quantities and for specific reasons, namely, in accordance with the written recommendation or prescription of a registered medical practitioner, for consumption on the premises, or for the provision of therapeutic services utilising ganja. Kaya Farms’ grand opening closed with a concert featuring Ky-mani Marley, Keznamdi, Jah 9, and Toots and the Maytals. Kaya Inc, a licensed ganja business in Jamaica that opened its first ganja cafe in Ocho Rios in March, is going public in Canada and will list on the Toronto Stock Exchange. Under the transaction, Kaya will enact a “reverse takeover” with a listed company called Buzz Capital. The takeover also comes with a separate plan to raise CAD$8.5 million of which CAD$5.5 million is being sought from institutional investors, while another entity called HIKU Brands has already agreed to provide backing of CAD$3 million, said Kaya Inc CEO and founder Balram Vaswani. The Kaya brand is framed on a shirt worn by Owen ‘JahJah’ Warren, chief grower at Kaya Farms, during the March 10 opening event for Kaya’s operations in St Ann. Kaya is merging with another company called Buzz Capital and will list on the Toronto Stock Exchange. The listing is being preceded by a series of transactions, which will see Kaya merging with Buzz. The latter company was formed in 2017 and listed on the TSX Venture Exchange in the same year, with the intent of being utilised as a vehicle for a takeover. Buzz issued a letter of intent about the transaction earlier this month indicating that the companies would finalise their negotiations and secure a deal by April 15. It will result in Kaya shareholders owning nearly nine-tenths of the amalgamated shares. Vaswani told the Financial Gleaner that the ganja authority in Jamaica was abreast of the dealings to list overseas. “All contemplated transactions are subject to oversight and approval of the Cannabis Licensing Authority. This includes both Jamaican ownership and directorship exceeding 50 per cent at all times,” he said. “We will continue to work with all governing bodies as we continue to build a Jamaican brand that can extend beyond the shores of our island. This will give all Jamaicans access to invest and participate in a transparent regulated industry,” said the ganjapreneur via email. The structure of the takeover deal involves Buzz enacting a reduction in its ordinary shareholding from 8.2 million to 4.1 million units followed by a name change from Buzz to Kaya Inc; then the exchange of all issued and outstanding shares of Kaya for common shares of the resulting entity; followed by the exchange of all issued and outstanding Kaya options and warrants for shares of the new entity. The resulting company is expected to have 43 million issued shares “of which approximately 89 per cent will be held by the current shareholders of Kaya, and 11 per cent by the existing shareholders of Buzz”, according to a press release on the transaction. Kaya reaped the first legal harvest for sale last month in the presence of the Cannabis Licensing Authority. This harvest will feed the stock of the store or herbhouse, the first of which opened in St Ann. The costs associated with the development of the cafe, dispensary, and farm to date have surpassed J$76 million.